Think about your life, remember the past. Let all the troubles that have been in the past: failure, trouble, doubt, unwanted actions and dark thoughts will burn in a flame of fire. Start of the second phase of the moon, the day changes, our deep changes. To change passed successfully, you need quite a bit. Need to abandon the progress internally. Forget for a moment about their merits. They are too easy to overestimate. The energy of this lunar day is directed inward. Outside, there may be some passivity. Did you pull into contact with fire. You will want to look at the sun or a candle, or just sit by the fire. Do not limit yourself. Day may be best for those who are prone to adventures, as well as for people who are able to sacrifice themselves. Many people experience an exacerbation perception. 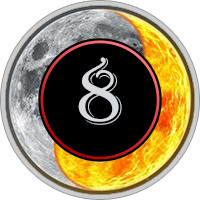 Eighth day of the moon - this time biochemical and alchemical transformations, when the body included the subtle energy. Active day, so there may be unforeseen events. Bad day for the slow-moving people. Day of humility and forgiveness, purity and transformation. Day of the inner fire that cleanses and purifies. Today we have to be pure and selfless, free ourselves from the weight of problems, and everything that holds us back, and move forward. Good day to visit with close friends and relatives, to forgive, bring positive new changes, build better relationships. Cleansing and fasting is recommended. Good to meditate on open flames, and cleanse home with burning candles. Meeting with unreliable people, stress and strain should be avoided. Be careful with fire! In this lunar day dreams indicate your ability that you haven’t yet realized. You can see an indication of the problems from which you turned away in the past and forgot, but they need to be solved. You can see the tasks for which you have the power, do not turn away from them, try to use this power to resolve the assigned tasks. Also, the images of dreams at this time show the ability for your changing and transformation. So if you saw confined spaces and obstacles it means you don’t have changing. If on the contrary, you saw open spaces, fields, mountains, sea, beautiful and bright room, it means you are going in the right direction. Thus, the main task of dreams on this day is to show your predestination. Carefully consider your dreams and keep in mind that life is rarely sets before us the great tasks, it may be from your point of view a small task, but it will be of great value to you.